Video is the fastest growing media people consume online. Not only is it growing among younger audiences, it’s growing for older ones too. 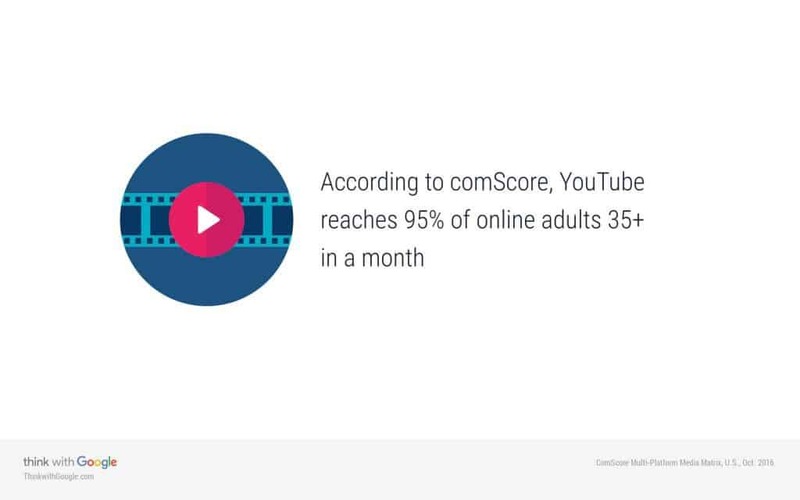 In fact, among online adults, YouTube reaches 95% of them (comScore). If you could put your small business in front of your customers for free, wouldn’t you leap at that chance? A small business YouTube channel makes it possible and there’s a huge audience available for free. Growing your small business online presence organically with YouTube is one of the many great options you have to reach targeted consumers who are more likely to become your customer. If you’re willing to put in some time to create useful content that your customers would like, you’re going to reach them. Why not just stick to traditional methods of advertising, though? YouTube has a huge built-in audience and your cost to reach them: 0. With time and effort you can reach hundreds to thousands of people and drive them to your small business online presence. That means you can bring them to a directory profile, social media profile, or even website! If your audience could possible be online then they’re on YouTube. With 95% of online adults reached every month on YouTube, it gives you access to your audience. Your YouTube profile gives you the opportunity to link back to your other online properties. Each video you publish also gives you the opportunity to link back to you in several different spots. YouTube is a powerful resource to capture views from your target audience and funnel them towards your brand. That means a constant flow of new leads will likely come from YouTube if you do it right. Not only that but your audience is increasingly becoming more mobile. People are watching YouTube on their mobile devices like never before and connecting with your customers on the go is increasingly more important. The first step in doing it right is to set up your YouTube channel completely. Google owns YouTube and unfortunately you can’t only create a YouTube account. If you have a Gmail or Google account already, you’re set to continue to the next step. If not, read this section. You have to create a Google account. On the YouTube home page click on the sign in button and then click the create account link. You’ll have to type in a bunch of information to create your account. This created your Google or Gmail account but you don’t have a YouTube channel yet. Creating your YouTube channel is another process separate from creating a YouTube account. Once you’re all set up with your new YouTube account, you’re ready to move on to creating your new channel. Creating a channel on YouTube is easy. The work behind your channel is the challenge part that takes a while to set up. From the YouTube home page you click on your avatar in the top right of the browser window and click the Creator Studio button to access the part of YouTube dedicated to creators. From there you can create your first YouTube channel by clicking the Create a channel link. YouTube will ask you for a few basic things to get your channel started. YouTube will make you create your channel under your name first but that’s OK, we’ll work around that. You want a brand account for your business, not a personal account. Or maybe you do want the channel under your name which is perfectly fine, you can stop now and move to the next section if that’s the case. If you’re like me and want to create a channel for my small business, though, you’ll need to create yet another YouTube channel. Now that you have your main account under your name (you don’t have to use it) you’ll want to create a brand account. To do this click that avatar in the top right of the browser window again. This time click the gear icon, though. From there you’ll see a small link at the bottom, Create a new channel, click on it. This time you can name your account whatever you want and click Create. Now you have two channels on your account and you can choose which one you want to use. To choose the account you want to browse YouTube with and post videos to, click the avatar again and you’ll see the two accounts. The one you’re on is on top and the other account is below that. The creator studio button is a helpful way to always get back to the creator tools of the account you’re active on. After your brand account is created, you’ll be in a great place to start the next section. 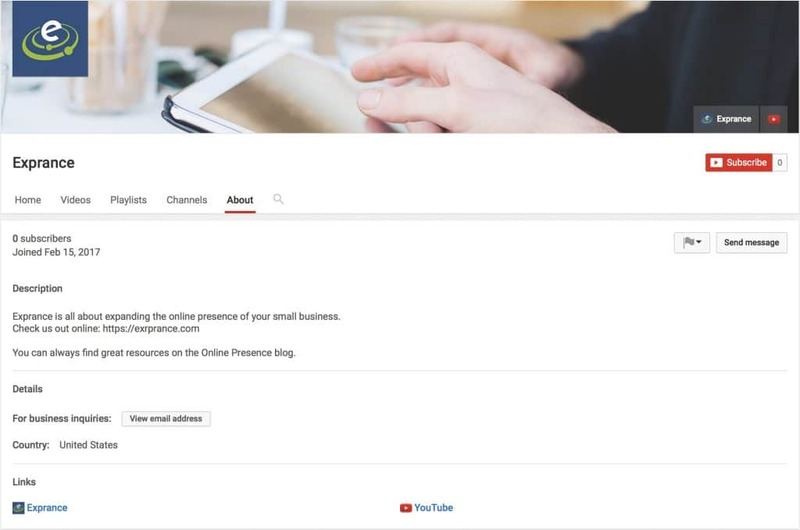 Your small business YouTube account is on its way to excellence. You have your channel set up but now all you need to do is configure it all. Be sure you’re ready to create a few images for your account because you’ll want to stand out. I’ll get to those shortly. Whoever you are in YouTube, you can start by configuring the description. With a new account it’s easy to get there by clicking the My channel link on the YouTube menu. With your new account there’s a convenient button titled Channel description that you can click to add a description. Click it and you’ll have a nice big text box to describe your channel. Use only text, never HTML or any special formatting (which you can’t do). Put the most important information in the first two lines (everything else is hidden behind an expand link). Include links to your website and social media accounts (links aren’t clickable but should be there). 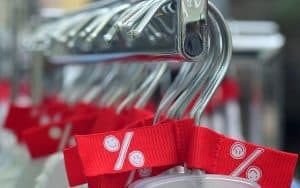 Use keywords that are relevant to your small business. 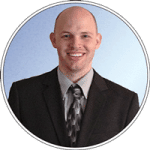 Include contact information to make it easy for viewers to reach you. By following these guidelines, you’ll provide a helpful way for viewers to understand what your YouTube channel is all about and how to contact you. You can type up to 1,000 characters into the channel description according to the basics about YouTube page. That’s it for the channel description, just be sure you use as much of the space as you can. You don’t want to waste the resources that are available to you. Next up is the account avatar or logo. This is the single most important image on your YouTube account because images are the defining factor of your small business online. Every time you show up in search results or any time a viewer is on your YouTube page, they’ll see this image. To add a logo to your account, click the pencil icon when you hover over it on your My channel page. From here you can upload an image to your YouTube channel or brand account. They’re one in the same according to YouTube because when you created your YouTube account, Google also created a brand page for you. I recommend you make your logo square and at least 512px by 512px but preferably larger so it appears in high quality. This logo shows up in many places so make sure it’s formatting to fit well within a circle and can be seen well in small and huge formats. If you ever want to update your logo, you can do it in the same place. There’s another image you must to have on your small business YouTube channel, channel art. This image is huge and sometimes can be a tough one to create because of all the devices it’s used on. It needs to look good on devices from a mobile phone to a TV. The recommended channel art size is 2560px by 1440px and absolute maximum file size is 4 MB. That gives you a lot to work with, though. Unfortunately it’s not as simple as creating one huge image and calling it done. Different portions of the image are used on different devices so it’s a balancing act. There’s not a simple way to create YouTube channel art unfortunately. Canva has a template for it but there’s no guidelines similar to their other templates. YouTube has a good resource page for helping you create the channel art, there’s even a template you can use with Photoshop that has guides for each size and helps you align items within the proper limitations. After you have your image created, you can upload it into YouTube from the My channel page where we left off above. Click the pencil icon in the top right of the channel art section. That or you can click the big blue button titled Add channel art. There are just a few more customizations you’ll want to do on your YouTube page before heading to the back-end part of things. With a minor change in YouTube you can customize how viewers see your YouTube page even more. These customizations begin the channel links that you’ll want to add. Beyond your channel description, your small business YouTube channel should link to some other online properties for your brand. You’ll probably want to link to your website and possible also some social media profiles to drive engagement. There’s a great way to integrate some of these links directly on your YouTube channel page, have them clickable, and represented by images. All YouTube pages are for the most part standard so YouTube watchers might be looking for these links. The first thing you’ll have to do is enable the ability to create channel links. You can do this by clicking the YouTube channel settings gear icon next to your channel subscriber count. 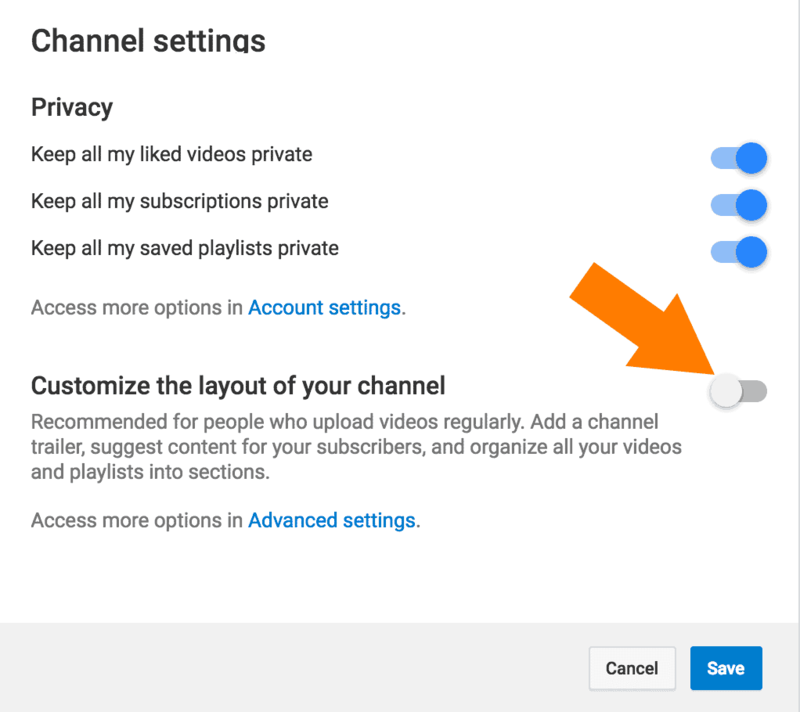 You can change other settings in here if you like but the big change you have to make is turning on the ‘customize the layout of your channel‘ option. Just click the toggle switch to turn it on and then click save. Now you’ll have an extra option when you click the pencil icon in the top right corner of your channel’s channel art, edit links. Clicking this link will bring you to your channel’s about page where you can add links among make some other changes. Clicking the add button will create a new line where you can type in a link title and the URL you want it to go to. These links will show up in the lower right corner of your channel art and pull the favorite image from that page. All the links you include here show up in the YouTube about page. You can choose to overlay only the first X links over the channel art, though. Notice the first link gets an extended look. It includes the favorite icon image plus the name you typed in. Any link after the first only gets an icon but hovering the mouse over it shows the full name you typed. That’s all the updates for the channel links. They’re a great way to include some calls to action on your YouTube page or send traffic towards your small business website. We left off from the section above in your channel’s about tab. There are some other important pieces of information you should include here and they’re easy to change now. Adding your business email address is a good idea. You want people to be able to contact you and some won’t bother to visit your website and look for a way to contact you. Click the Email button next to the ‘for business inquiries’ section. This part is that simple. 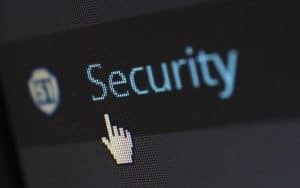 Visitors to your channel won’t see your email address but rather a button. They’ll have to solve a quick CAPTCHA to get access to your email address. You’re able to change the country your channel caters to on this screen also, I recommend you do this to make sure your channel reaches the correct people. Now that you have all the front-end YouTube channel stuff complete, it should look pretty nice. When visitors click on the about tab on your channel they’ll see something similar to the picture below. There’s more to your page, though, so don’t miss the next sections you’ll need to update. This is a completely set up small business YouTube channel about tab with links, contact information, and a description. Your channel is looking really good at this point. Your channel name, description, both image, and all the other front-end details are looking good. Now it’s time to look towards the back-end of your YouTube account. Beyond this is the behind the scenes part of your YouTube channel but will determine a lot of how your channel show up to viewers on YouTube. You already have the name of your channel set from when you created it but what if you want to change it? The channel name can be changed in the back-end settings of YouTube. 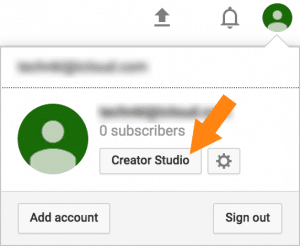 To get there, click your avatar in the top right of the YouTube page and then click creator studio. From there, click the channel section in the left hand menu and advanced in that section. You can update your channel name by clicking the change link next to your current name. You’re also able to change your avatar from here also. The next options is a duplicate, odd huh? Yes, country is in the settings twice even though you updated it already. This is just a goofy part of YouTube and we have to do it. So, go ahead and change your country again. Be sure after you make changes on this page you click the save button at the bottom, changes aren’t made real-time. Now it’s time for some keywords. Your channel keywords will help tell YouTube what your channel is all about and help it rank your page in search results. While these aren’t the absolute most important part of YouTube, they should be included. Type single words separated by a space and create a keyword phrase (1-2 words only) by putting quotes around them. There are limitations to how many characters can be included in the keywords but I couldn’t find exactly what that limitations is. That’s it for the big stuff, you may want to change some of the other settings on this page, though. There are other change you can make on this page. 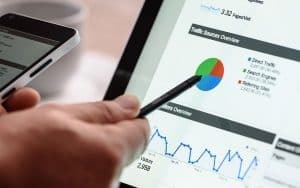 You can do things like connect your channel to a Google Analytics property or to your AdWords account to display ads. I wouldn’t recommend trying to monetize your videos if you’re trying to attract customers to your business, though. You want to help people not sell other products and distract them from your content. 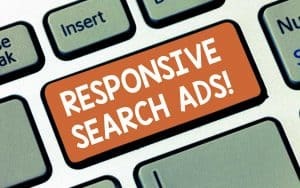 Besides, you may never reach a level of traffic that would give you any significant amount of money. Once you’ve made all the changes you’d like, be sure to save them! This part is important because you want to brand your videos as much as possible. Rather than include the branding in your video, YouTube lets you add it dynamically in the branding section. The branding section is in the left side menu, just above advanced. You can add an image with transparency to your videos. YouTube will place this image on your video and you can even choose when it’s placed on there. I prefer to put my company watermark over the entire video but you can also choose a custom start time for it to display. Your watermark also acts as a way for viewers to subscribe to your channel. They can click it and then choose to subscribe. You probably are just setting up your YouTube channel so you don’t have any videos. Once you do have a video or two, there are a few more updates you should make to your channel. Once your channel is established more, there are some more updates you’ll want to make. The featured content (on the left hand menu just above branding) allows you to feature content on your YouTube channel page and videos. The featured video or playlist will pop out of the side of your video towards the end of your video or at a custom time (your choice). This is a great option to keep people watching your YouTube videos longer. YouTube lets you select one of your videos to be your channel ad. This video will show when people visit your YouTube channel home page. YouTube may also use this video elsewhere on YouTube to promote your channel. That’s everything you need to know to set up your small business YouTube channel. You now have a complete, branded, nice channel that stays consistent to your company brand. Creating your small business online presence and spreading your reach to new customers gives you a lot of options. YouTube is one of the many great options out there to bring organic traffic to your website and potentially drive new business. With the right content and the right consistency, free, organic advertising is easy to grasp. Not only that but the visitors you’ll attract are infinitely more valuable because they’re targeted and you know they’re in the market for what you’re selling. Are you ready to see how your small business can benefit from a professional online presence? It’s time for you to get your free personalize Online Presence Report or get started faster and receive a free quote with optional consultation. Great guide, Nick. It’s nteresting to hear your mind about the difference of choosing video and channel keywords. I found that it’s really difficult to find cases where we can evaluate the importance of different channel keywords exactly. We can test it in some ways, but to provide a clear experiment is difficult. Have you any experience with such test? No specific experiment but YouTube is so unknown and unpredictable I don’t think even an experiment would be accurate. You can create two different channels and post the same video with some differences. One video may get 10 views and the other could get 1 million. It seems to be that unpredictable and random. At least that’s what I’ve found and of course, it really depends on what you’re creating videos on. Every topic will react differently on YouTube.